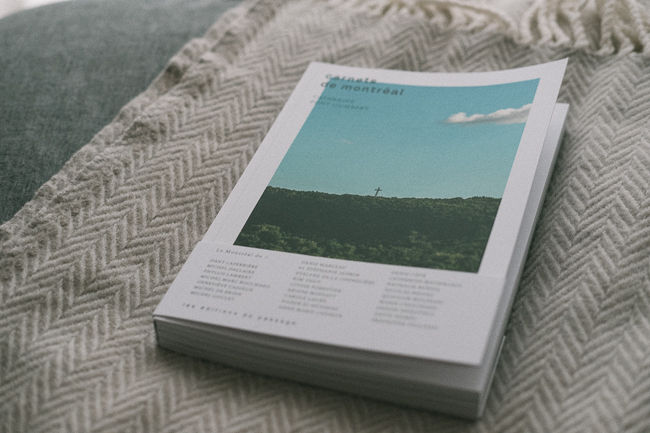 I was hired by the wonderful team at Les Édtitions du Passage to provide the photography for Carnets de Montréal. In this book, French author Catherine Pont-Humbert takes a close look at Montreal culture via her 24 conversations with local artists and creatives (including Dany Laferrière, Nathalie Bondil, Michel Dallaire, Phyllis Lambert, Kim Thuy, Ariane Moffatt, among others). In each chapter, we learn about the artist, their connection to Montreal, their favourite neighbourhoods and hangout spots, and we also learn quite a bit about the city’s history. The 24 artists give us an introspective look at our own culture, but at the same time, this is all told from the outside perspective of the French author. The result is a book that is both thoughtful and entertaining (and even practical as a guide book!). Before Lea from dfigraphik put everything into a neat beautiful package, I had to provide photographs to complement the text. Some chapters were relatively easy to visualize, since the chapters referred specific locations prominently. Other chapters had less literal content to photograph. For example, some artists described a certain mood or energy of a neighbourhood. These were the most rewarding and challenging to conceptualize and capture. In the end, the project brought me everywhere from Hochelaga to Parc-Extension, it gave me an excuse to photograph strangers and forced me to wait patiently for sunsets and the perfect clouds. I’m thrilled with the end result and I had fun exploring my own city and discovering new places I had never been to. And I have to admit that it was pretty cool to have the book launch at the Montreal Museum of Fine Arts. Below are a few photos from the book. Thanks for reading! To keep up with my work, follow me on Facebook or Instagram!